How I created a landing page and sign-up form in about 15 minutes. This past weekend I needed to quickly create a sign up page for my wife’s new newsletter. I didn’t want to bother with creating a new hosting account, installing WordPress and using a plugin to connect the form to MailChimp. The alternative and easier solution is a landing page generator that handles the design, hosting and form integration. 1. You can start a free 30-day trial without even entering a credit card. LeadPages is just a money-back guarantee. 2. LeadPages is a reverse domain name hijacker. I found Instapage to be fairly simple to use, but I almost didn’t get past the first few minutes of using it. Instead of sending you to a page to select a template to edit, it sends you through a tutorial page that helps you create your first template. It’s not clear that it’s a tutorial and makes things more complicated than they need to be. I couldn’t find a way to exit out of it, so I had to go through the motions. Just let me pick a template and start editing! It was easy once I got over this small hurdle. I was able to create this landing page in about 15 minutes. I contacted support after running into a small issue with resizing the background. Not only did the support person make the change for me, but they also sent a screen capture video of him making the change so I could learn how to do it. Hosting the form was simple. I just created a CNAME record at GoDaddy to point to the form. Instapage packages start at $29 per month (when paid annually). This seems like a good deal for people creating lots of landing pages and lead forms. But it probably doesn’t make sense for someone who just needs a simple one-page lander that links to MailChimp. At $348/year, it probably makes more sense to pay someone to set up a simple site on the domain and cut the monthly costs. It would be nice if Instapage had some sort of “starter” package for $5 a month or so for people who have limited needs. Great idea on using Instapage. I’ve also tried to setup my own wordpress website for landing pages. Both will run you about $5 per month plus your time in setting it up. In the end, I tried Efty.com and have been very happy. It’s about the same price ($4 per month), very little setup and it keeps track of all my leads in an organized database and THEY do all the updating. Love that. Great story Andrew and definitely a very Positive and useful advantage for the competition in this Exploding Domain Business — The Chinese have been Really Great — But there is Still a lot of untapped markets left out there — Thanks Much !!! Thanks for the feedback on the intro tutorial, Andrew. 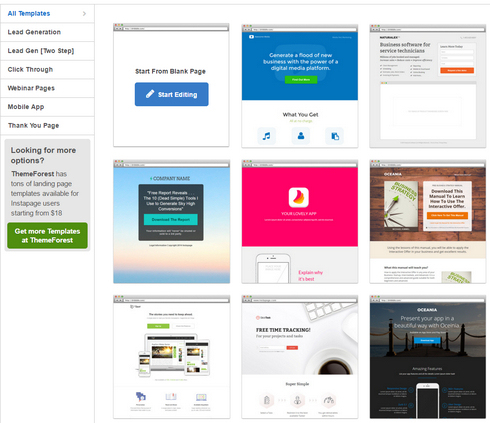 Glad you found Instapage useful and otherwise a good product for your quick landing page! Hope your wife’s newsletter is getting some traction.